5 stars on the premise, minus the execution and lack of maturity in the characters. I can’t hand out a favorable review just because the book is about tough subject matter. If this book had been written in a younger age-range, perhaps 14 year olds instead of college-age adults, I could have forgiven the immaturity of the voice. To be totally honest, it felt as if a more mature person was writing this novel, envisioning how a college freshman would think, but ended up sounding more like a freshman in high school using adult words instead. Finding the Upside of Down has a good premise and a well-written blurb, but the writing style isn’t delivering. Tabitha is a college freshman, who has been bullied since kindergarten by Amelia. The first day of college Amelia shows up to bully Tabitha continuously. Why I find this not realistic and difficult to read: It’s almost a mockery of how it truly is to bully and be bullied. Perhaps if this took place during junior high or high school, I could have bought into it. Amelia is almost comically bad at being a villain. The taunts, teases, and bullying tactics are more of a 10-year-old, not a grown adult in college. How small is this college campus and surrounding town to be everywhere Tabitha is without searching for her? Who has the time when they are paying for an education, studying, working, social and family life, to always be where Tabitha is, from day one. How did Amelia even know where to be, when Tabitha herself was just learning where she had to be? Amelia was a step ahead, when Tabitha’s steps weren’t predestined but just taken at random. The odds of her knowing Tabitha’s class schedule, managing to be in said classes, and getting to locations prior to Tabitha when they left at the same time, knowing her brand new unlisted cellphone number… and so on. Knowing when she texted her friends and didn't receive a reply. In a college class with 17+ year olds, one student is 22, maybe one or two would have laughed at Tabitha and found Amelia funny. But the other students would have found her as ridiculous as I did. Comically bad, juvenile, a disturbed mentality, perhaps mentally ill. These students are paying for an education, and there to work. They are intelligent individuals and wouldn’t have time for Amelia disrupting a class in which they work hard to pay for it. The age range at a college, which provides continuing education for adults, would be up to retirement age. I can't see many standing by and accepting this. I also need to add, stalking and harassment is a crime – not a ‘just ignore it.’ I would have taken the text messages and threatening notes and had Amelia arrested. The just ignore it felt irresponsible to read, especially since this is a young adult novel. While I believe bullying is a huge issue people face on a daily basis, and a premise worth exploring in literature, I felt the execution of it during this novel was too over-the-top and juvenile for the age-range of the characters. Amelia leaving a box of pregnancy tests on the counter in a public bathroom at college. Tabitha was mortified someone would think they belonged to her. Why? Who cares? That’s an expensive prank with no payoff. What are the odds anyone would be in the bathroom at the same time? So what if someone thinks the tests belong to Tabitha the adult? Why would anyone jump to the conclusion the tests were Tabitha’s just because they were on the counter? This is shaming to women, as if getting pregnant is shameful. A woman may raise an eyebrow when seeing the test, but that's it. Maybe ask if you need some moral support. I don't know what world these grown women are from – junior high, I suspect. Wouldn't it have been more embarrassing for Amelia when she bought the tests, than to leave them on the counter for Tabitha to find? Checking out is in public, the restroom is in private. Amelia knocking all the stuff off Tabitha’s desk, then snickering as she walked away, leaving Tabitha to feel mortified. I’m at a loss how this is humiliating for Tabitha – infuriating, yes. Mortifying or humiliating – how? I’ve accidentally knocked someone’s belongings over, and *I* felt like a moron and apologized, and the other person had no blame placed on them whatsoever. No one cares – they're in college to get an education. Just as they don’t know what’s in the notes placed on Tabitha’s desk (considering she sat at different desks, I was unsure how Amelia guessed which desk to place it on) so why would they all snicker as Tabitha opened a threatening note? Who cares? The other students don’t. They don’t know either of them, nor would they laugh for no reason. The juvenile bent to the story, when set in an adult world, the voice of the narrator being at least five or more years younger than her age group, made reading a book which should have been profound, to be a chore. Recommended for young adults, even if this is listed in the New Adult age-range. I would suggest actual children, not those who read the young adult genre as adults, as I do. Will I read more by this author? To be honest, the writing style is not to my tastes. Dionie was a closet writer for several years before she got brave enough to share her work with anyone until she joined Eyre Writers Inc, a creative writing group in the seaside town of Port Lincoln and really began to improve. Her first book was a 100,000 words family saga novel, but after studying children’s literature at university she embarked on a new direction—writing a young adult fantasy novel. When Dionie is not writing she enjoys spending time with family and friends, especially her mother, and three wonderful adult children and adorable grandchildren. She also enjoys egg decorating and carving, reading of course, painting, gardening and cooking. 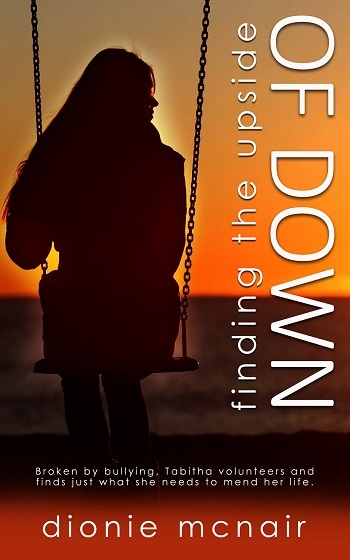 Reviewers on the Wicked Reads Review Team were provided a free copy of Finding the Upside of Down by Dionie McNair to read and review.